Located one km south of the Sthala Sayana Perumal Divya Desam on the way to the light house is a lesser known but an ancient Pallava period rock cut cave temple dedicated to Varaha Perumal. This temple pre dates the Kadal Mallai Divya Desam in Maamallapuram and is one of the two Vishnu temples that have survived ravages of the sea over the last 10centuries. A Pallava King made a daily trip to the Varaha Perumal temple at Thiru Vidanthai (15kms north of here on the East Coast Road). He would have his morning food only after this darshan. Also, it was his practice to feed a 1000people each day after coming back from Thiru Vidanthai. Lord Vishnu decided to put his devotion to test. One morning he appeared before the king as a hungry Brahmin carrying along with a child (Goddess in disguise). The king requested if he could first make his daily trip to Thiru Vidanthai and then offer them food as that was his practice. The Lord in disguise rejected this suggestion stating that he was dying of hunger and that it may be too late for the child by the time the king returned. Invoking the blessings of Varaha Perumal of Thiru Vidanthai, the king decided that feeding a hungry child was more important than his trip. 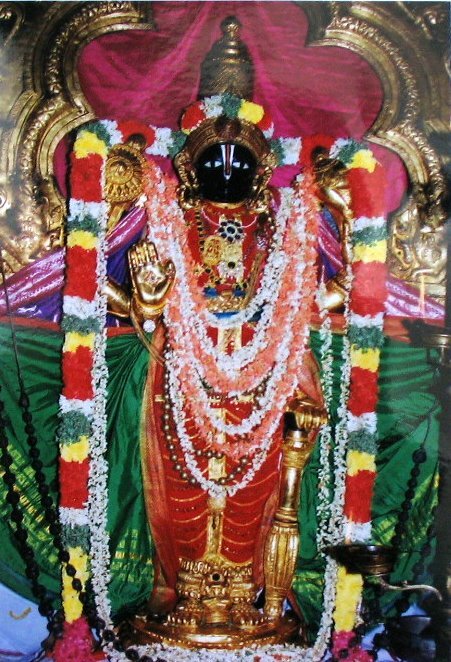 Pleased with the king’s true devotion, the disguised Lord provided darshan to the king at the same place as Varaha Perumal with Agilavalli Thaayar on his right side ( at Thiru Vidanthai, Goddess is seen to the left of the Lord). 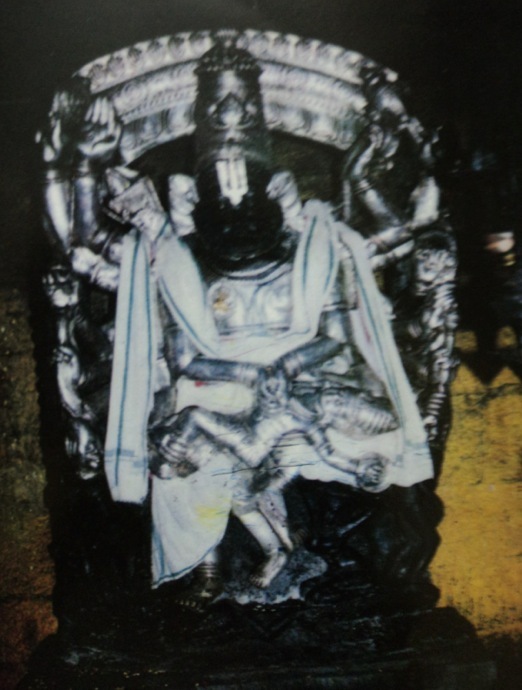 At this cave temple, the moolavar Varna Kala moorthy Aadhi Varaha Perumal is sculpted on the rock with his left leg placed on a Naga King and Queen and with his left hand on Thaayar’s lap. 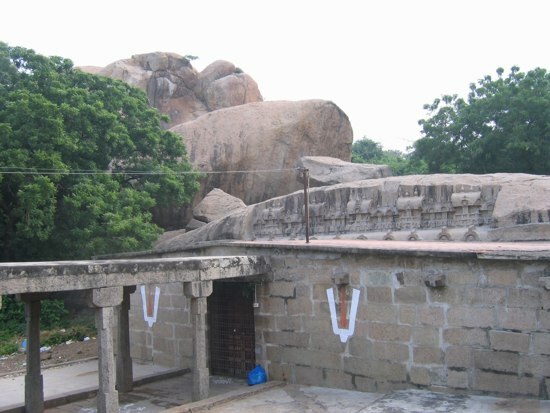 Pallava King Simha Vishnu is believed to have built this cave temple. In memory of his contribution, one finds stone moorthys of Simha Vishnu along with his son Mahendra Varma Pallava. There are also exquisite stone moorthys of Rudra, Brahmma, Goddess Lakshmi and Durga inside this cave temple. An interesting feature at the temple is the entrance to a secret 15km long tunnel (now shut) that was once an underground route to the Nithya Kalyana Perumal temple in Thiru Vidanthai. One also finds such a secret passage at Parameswara Vinnagaram (Vaikunta Perumal) Divya Desam in Kanchipuram which once led to Maamallapuram almost 70kms east. On the full moon day in Maasi every year, the utsava moorthy, Gnanapiran, goes on a procession to the sea shore on a Garuda Vahana. Auto from Sthala Sayana Perumal temple will cost Rs. 40.
thanks a lot for the information about the cave temple. Thanks for the information. It was at this temple Annadanam was performed by Karumbur village agraharam residents. This is being continued even today by Kothimangalam family. Please visit Thiruvattar, one of the divya desam near Nagerkovil. 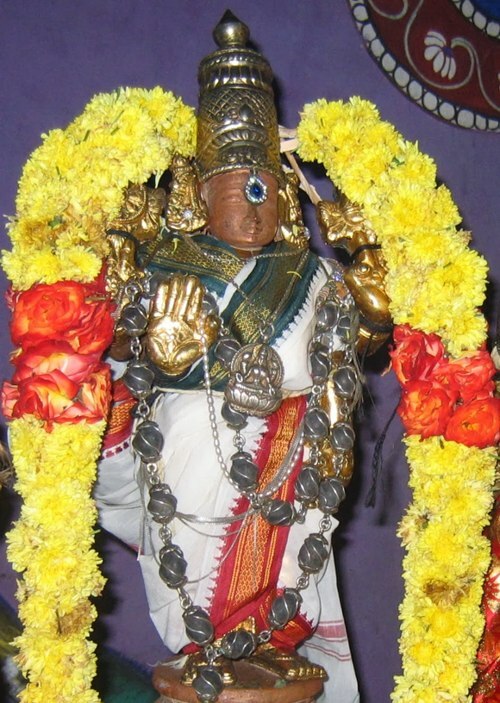 The moolavar deity is Adikesava perumal, in the sleeping posture on his left side. Two cents for your search !! With Perumal anugraham had dharshan of aadi varaha perumal on Saturday December 21,2013.Battar swami was kind enough to explain the stala puranam.The above article is very useful article for bhakthas coming to have dharshan of Stala Sayana Perumal and Nilanmangai Thayar to have the darshan of Aadi Varaha Perumal and Agilavalli Thayar. Thank you, for the information. I had been to both places.But it is not the same as in my dream. I had one more similar dream. 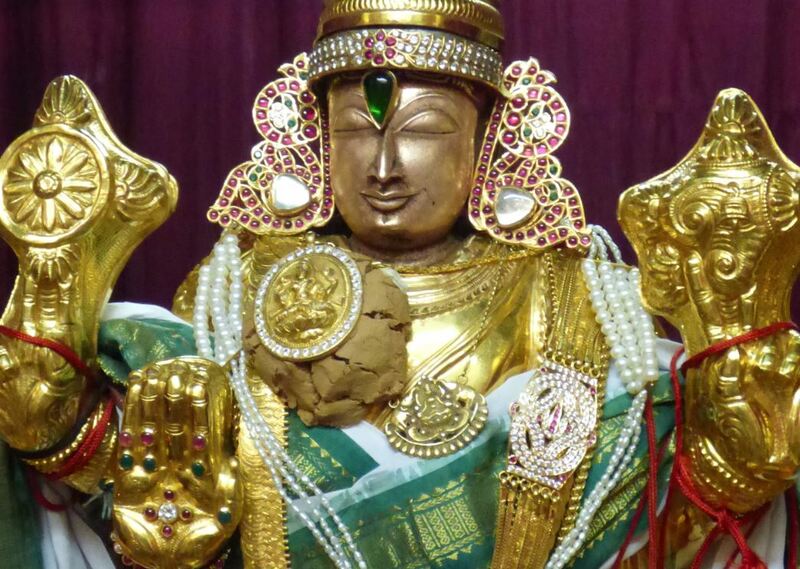 sri maha vishnu, lyning on left side not on Hand,and it in varna kalaapam, beautifull and colorful. It is located somewhere in Tamilnadu. Any one Knows? i do recvognise the place, not exact location.